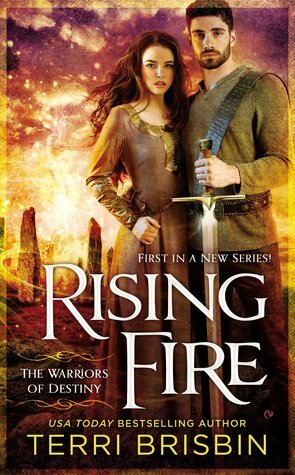 Rising Fire is the debut novel in a new fantasy romance series, Stone Circles. Although it was slow to start, it blossomed into a promising first installment, and I look forward to the next one. The beginning of this novel was like the start of a good chess match: slow to start as the players move their pieces into their battle positions, then once all the pieces are on the board, the excitement begins. This is how Rising Fire started to me. It needed some world-building, and pieces needed to evolve and be maneuvered into place. Although the pace felt sluggish, the tension was slowly ratcheting up. The slowly burning romance between William and Brienne was intriguing and added to the slowly increasing tension. I really enjoyed William and Brienne’s journey. They both found themselves in roles they didn’t expect and in the midst of trying to do what is right, found each other. I enjoyed how they danced about each other and then finally came together. Though compelled by the supernatural forces at work, they still got to take some time to know each other. William is overwhelming but also tries to be a gentleman, even with the compulsion he feels. I love how innately good and loyal he is. Brienne is also innately good, even with the blood of her ancestors in her. I really enjoyed watching her chose what is good, to not be defined by genetics but by environment. Her journey of self-discovery was touching within the realms of the impending conflict. Though our heroes were able to thwart evil at this first circle, we are left with knowing they are behind on the next one. I found the mythology of the lost gods fascinating. The awakening of those blessed by the gods was intriguing since most of the history of these gods is lost. It was really enthralling to watch, especially William, come to peace with who and what he is. It will be interesting to see how the next couple fairs with this knowledge and the impending conflict. If you enjoy a well-balanced fantasy romance, you may just want to pick up Rising Fire. Though it does require a bit of patience as the novel opens, it does pick up, and I found myself lost in the world and beautiful journey of William and Brienne. I look forward to the next installment in the Novels of the Stone Circles. Handsome, fearless, and commanding, William de Brus has been summoned by the king to investigate a nobleman rumored to have powers linked to the fabled fire goddess. When he chances upon Brienne, his desire for her is immediate. But as his mystical quest unfolds, William realizes that she is at the center of it — for Brienne possesses the very power he has been sent to vanquish…. It is a good start to what could be a really great series!